About the year A.D. 500, the invading Angles reached Leicestershire, and in the first half of the sixth century “the People of Peotla” occupied the large and commanding ridge of good land now called Wigston. There are evidences of a Pagan cemetery here. Wigston’s history, therefore, begins some fourteen hundred years back, although the road on which it stands is itself of greater and unknown age, certainly older than the Romans and probably dates from the Iron Age. Some Roman remains have been found at South Wigston. In its present form “Wigston” is an Anglo-Scandinavian name of the nineth or early tenth century - “Viking’s Tun”, so called after some Danish overlord. In the Domesday Book, it was recorded as Winchingestone and in 1191, it was spelt Wikingeston. Other versions have included Wiggeston, Wykyngestone and Wyginston. The earlier village, its name we know not, was probably destroyed by the Danes in the fighting for and around Leicester (A.D. 868), and the settlement given a new name when it was rebuilt. Some of the finest Saxon remains in the county were found at Wigston in 1795 and also at nearby Glen Parva. Originally a “ring fenced” village, four roads lined with cottages enclosed an area of about 40 acres, being ringed round by a fence as protection against sudden attack from the surrounding forest. Under Edward the Confessor, the Lordship of Wigston was held by his nephew, Earl Ralph of Hereford. After the Conquest, however, when at Leicester in 1068, William I granted the Lordship to Hugh de Grantemaisnil, one of his principal barons, who was also appointed High Steward of England and Viscount of Leicestershire. At the time of the Domesday survey (A.D. 1086) he, together with the Countess Judith, William’s niece, owned all the land in Wigston. At this time there were two knights, thirty one yeoman farmers and forty four serfs, in addition to a cleric and a priest - thus confirming the long establishment of Christianity within the district, and identifying it as one of the largest places in the county at this period. For centuries Wigston was divided into three open arable fields, and from the early thirteenth century they were known as Mucklowe Field, Thythornhill Field and Twobrokes Field. This last name was later changed to Gold Hill Field, and these appellations remained until the Enclosure Award of 1766 put a formal end to their existence, though they still live on in various forms. Early in the reign of Henry I, and about A.D. 1107, Robert de Beaumont, Earl of Leicester, granted the living and tithes at Wigston to the Priory of Lenton in Nottingham and this was confirmed in 1140 by King Stephen. it is possible that the Manor was acquired by the Pochins, a family of royal descent, who have resided in Wigston for several hundred years, as have another family who can claim royal connections, the Freers. About the year 1200, Wigston’s other manor, together with its lands, formed part of the estate of Sir Hugh de Campania. It remained in his family until, owing to there being no male heir, the estates were divided between three sisters. John Turvill succeeded to the Wigston estates about 1474. However, Henry Turvill disposed of the lands to a number of different purchasers towards the end of Queen Elizabeth’s reign, in about 1600. It will be seen that for the past 350 years there have been a large number of local landowners. having been built in 1684 (since rebuilt). were brought from the County Goal to be lodged where is now the Memorial Park. After the defeat of Charles I at Naseby on the 14th June 1645, the victorious Oliver Cromwell spent the night at the Manor House which still stands in Newgate End. One of the oldest families in Wigston is the Eryck or Herrick family who, like the Gambles, have been here for 1,000 years. Abigaile Erick, the mother of Jonathon Swift, lived at Wigston after being widowed, and late in the seventeenth century he came to stay with her. During this period of inactivity, free from the rounds of court life and party affairs, it is probable that he spent much of his time writing. Swift’s mother died in 1710, before he had been appointed Dean of St. Patrick’s, Dublin. district.In 1764 an Act of Parliament known as the “Wigston Act” was passed. This gave lands in lieu of tithes to the Duke of St. Albans and to the vicar, and divided the rest of the land between the various other landowners. A further Act was passed in the following year making a turnpike road from Welford to Leicester, which became the main route of the mail coach from Leicester to London. The Blue Bell Inn, which stood in Bell Street, was a noted coaching hostelry. The town had been governed for many hundreds of years by “Manor Courts”, and we can read from the Chronicles that four watchmen were appointed in 1394 to patrol the town at nights. Records of the Town Constables are preserved from 1654. The last of these “Courts” was held in 1838.By an order of Queen Elizabeth I, the ancient practice of “Beating the Bounds” was carried out and continued until 1750. One established custom still remaining is the Annual Rogation-tide procession which has been taking place for some 500 years. In the limited space of this book it is merely possible to mention the eight cases of murder and sudden death in the fourteenth century, the butts on the green, the cockpit and the bearpit, and the possible witch-burning. Few of Wigston’s old buildings remain but there are many old street names. The almshouses in Long Street - a hospital for twelve old people founded by the Elizabeth Clarke Charity and built in 1781 - were a good example of the local brickwork. These almshouses have recently been demolished, but a plaque commemorating the foundation of the Charity has been incorporated in the brickwork of one of the nine new bungalows for old people erected on the site. 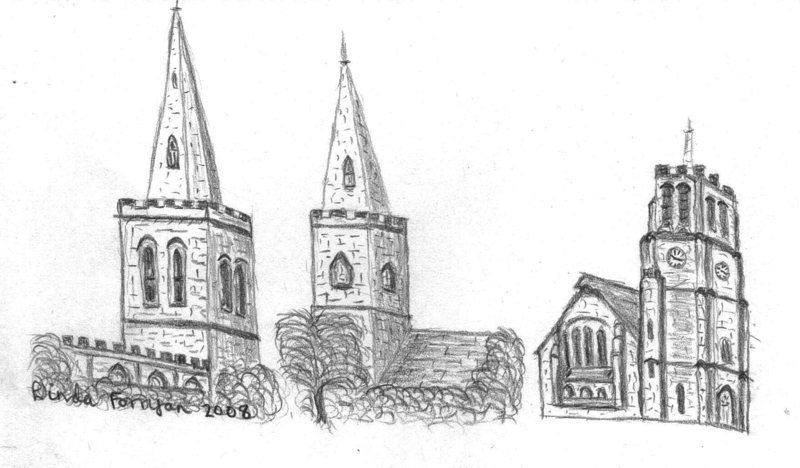 The two parish churches, the Congregational Church and one or two Georgian and earlier houses and farms are worthy of note. The Rectory Farm may even occupy the site of a pre-Saxon holding, but the present building2 is eighteenth century work. It would appear that the oldest known medieval house in Wigston was a large moated mansion which stood to the south of All Saints’ Church in Newgate End, near the stream. In 1630 the house was the home of the Davenport family, who gave much to the church, and some of whom are buried therein. They later provided one of Wigston’s most famous characters in the person of George Davenport, a highwayman for eighteen years. He was finally caught, tried and hanged in 1797 and was buried in All Saints’ churchyard. It is recorded that this old house was in total ruin, except for the Chapel, early in the eighteenth century, and no trace is now to be seen of it.